Alessandro and I met in our first year of college. I had gone to high school with many of his friends, but he did not come to the same school as us, so somehow we never met before. He says that he remembers seeing me out once, and remembers me specifically as the tall blonde wearing pink shorts; however I never really remember crossing paths before. When I first saw him, I was instantly attracted to him. He was always well dressed, constantly smiling and so kind to everyone around him! Alessandro and I started dating not long after we met! We quickly went from hanging out in groups with friends, to texting, to talking on the phone all night until 5 am. Although we were barely 18 years old, we fell in love so fast! It just felt right. Alessandro was not the typical adolescent; he had great values, was respectful, and was so mature and driven. This all made me love him even more. I have learned so much from him and he has truly made me feel so loved. He is my best friend in the whole world, the first person I run to good or bad, he has always been there every step of the way. We are so lucky to have continued to grow so strongly together as a couple over the last 7 and a half years. I feel blessed to have been able to share so many big moments, and such wonderful memories that will last a lifetime. I’m the luckiest person in the world to be marrying my best friend and soul mate. I just cannot wait for the next chapter of our life together! New York City is actually one of our favorite cities in the world, and also happens to be the first city we ever travelled to together. Alessandro often travels for work, and many times invites me to go along with him. When he asked me to join him on this trip to New York, of course I jumped at the occasion to go with him. Alessandro was obviously clever, and he made me take care of all the restaurant bookings, and even made sure I booked for 3 people on Saturday night, since we would be dining with his business associate. Saturday afternoon, Alessandro got a call from his business associate “Chris” saying that we should meet at his hotel for drinks before our dinner reservations at 9pm. Chris even texted him the hotel name and address, so everything seemed completely normal. Around 7:30pmwe were on our way to meet Chris for drinks at his hotel. Once we got there, we made our way up to the top floor and walked into a lounge area. The hostess (who actually happened to be the coordinator of the proposal and pretended to be “Chris”) walked us towards the rooftop terrace, when I can start to feel Alessandro’s hand shaking. As we got closer to the door of the terrace I could start to see candles and rose petals on the floor, and instantly my heart dropped. As Alessandro walked me to the middle of the terrace he got down on one knee and asked to marry me. I could not stop crying because it all felt like such a beautiful dream. Seeing him down on one knee was the most precious thing I had ever seen, and I will cherish those memories for the rest of my life. Thinking of all the thought and effort he put into making this moment so magical means the world to me. We popped open a bottle of champagne and toasted to a lifetime of love and happiness together. This trip to New York City was the best trip of our lives, and I could not have asked for a more thoughtful and loving finance! Travel around the city like a celebrity. 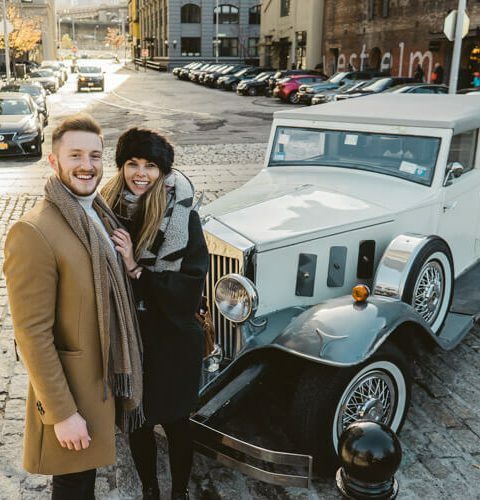 Your chauffeur drives you to the popular city landmarks in New York such as Central Park, the Empire State Building, Brooklyn Bridge, Wall Street. Or you chose your own destination. Upon booking, you and your Planner choose the best proposal location where our secret photographer and majestic decorations will be waiting for you. Proposal duration is approximately 3hr.